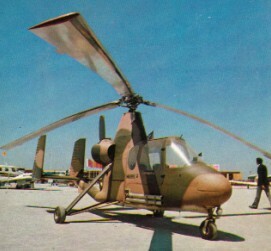 The U-17 gyrocopter was designed by Raymond E. Umbaugh with a 4130 welded tube centre section, aluminium forward fuselage and tail. His U-17 design was a tandem two-seat machine with a slim low-set tailboom and a single fin and T-tailplane. The prototype, N43U, was built for Umbaugh by the Fairchild Engine & Airplane Corporation at Hagerstown, Maryland. It made its first flight in mid-1959 and was powered by a 195kW Lycoming engine. The second prototype, designated U-18, was redesigned to eliminate the stability problems of the first prototype. This aircraft was fitted with a 135kW Lycoming 0-360 and, initially, with a V-tail. The stability problems were still not resolved and a new triple tail was installed with a low-set tailplane bearing two fixed fins and a third movable one in the centre. This improved the Umbaugh to the point where it was awarded its Type Certificate (1H 17) on 12 September 1961, and certification of the production version, the Model 18-A, was granted early in 1965. Ray Umbaugh embarked on an ambitious plan to market the U-18, placing an order for 10000 units with Fairchild as the Flymobil. A large network of dealers and distributors was set up in the United States but Umbaugh started to run into trouble because the manufacturing output of the U-18 was too slow to meet the demands of dealers for demonstration aircraft. The dealers, who had paid large franchise fees took over Umbaugh, the agreement with Fairchild was terminated and manufacturing moved to Florida. Fairchild built only five development aircraft during 1960, all being tandem 2-seaters with 180hp Lycoming O-360-A1D engines. The company finally collapsed with just four aircraft completed and flown. 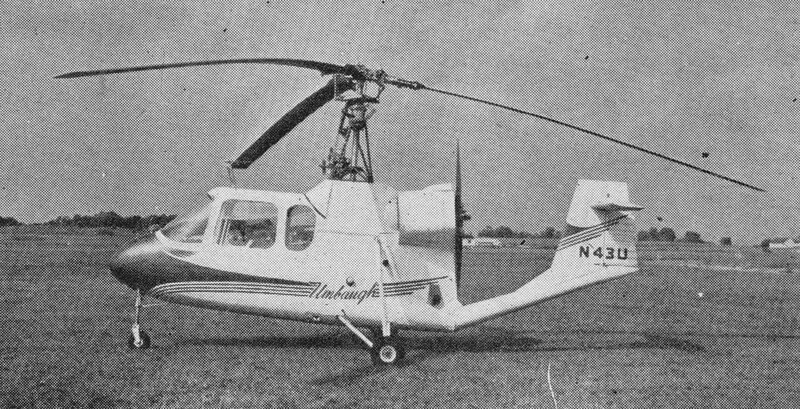 Basic price of the Umbaugh 18 was quoted as $9,995 (£3,498), or $11,695 (£4,093) for the deluxe model 18A, in July 1962. The design was then acquired by Air & Space Manufacturing of Muncie, Indiana in 1965, which made some modifications to the tail unit and commenced manufacture of the Air & Space 18A. Again, Air & Space was faced with dealer pressure for aircraft and set out to raise capital for expansion. This funds-raising exercise resulted in accusations from the Securities & Exchange Commission of irregularities in the commercial claims made to new investors and, though the company's management was eventually cleared of wrongdoing, the costs and delay resulted in the company's collapse. A total of 99 production aircraft had been registered though only 67 of these appear to have been actually completed by the end of 1965. The assets of Air & Space then went into storage but were eventually reinstated by one of the dealers, Don Farrington of Paducah, Kentucky. The autogyro has an all-metal fuselage skin, and wooden rotor blades reinforced with glassfibre. The engine drive can be connected to the rotor for jump starts, after which it is disengaged and clutched to the pusher propeller for forward movement. In 1972 Farrington Aircraft Corporation proposed a Forward Air Control version, with provision for air-to-ground rockets for target marking. Lacking the rights to the type certificate, Farrington Aircraft set up a programme to remanufacture existing aircraft with a modified collective pitch system, fibreglass engine cowlings and new composite blades. 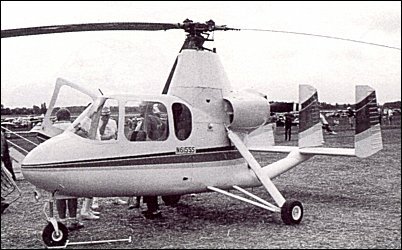 Farrington Aircraft produced the tandem two-seat Model 20A Heliplane cabin autogyro as a modern development of the Air & Space Model 18-A. Farrington has also developed an amateur-built kit gyrocopter with some features of the Umbaugh U-18 known as the Farrington "Twinstar".